No one can deny that one of the all-important contributions to the ministry of evangelical Christianity during our country's history has been the role of the Sunday school. This concern for reaching children and teaching them the gospel had not always been present throughout church history, however. For years the church's main goal was merely the catechetical indoctrination of its children in the practices and responsibilities of good churchmanship. There was little desire for establishing personal life-changing relations with God and not much genuine interest in the social and moral welfare of the masses of children in society. One of the important names in the history of the modem Sunday School movement is the name of Robert Raikes, 1736-1811, often called the "founder of the modern Sunday school." Raikes was born in Gloucester, England, of respected, middle-class parents. Though he himself enjoyed a prosperous and good life early in his career as the town's newspaper editor, Raikes became intensely concerned with the spiritual and social condition of the great masses of poor, illiterate children. Except for the wealthy there was no education for four out of five children. Child labor was shamefully exploited. The child that reached adolescence with normal health was almost an exception. The great masses of people were poor, wretched moral degenerates while the respected church people remained politely detached from them. In the midst of these conditions Raikes began taking children off the street and teaching them Biblical truths as well as the ability to read and write. Later the followers of John and Charles Wesley, the Methodists, began establishing Sunday Schools, first in England and then in this country after the Revolutionary War. Still later the Sunday School movement was encouraged further by the founding of the American Sunday School Union in 1824. As this concern for children developed, it became apparent to Christian leaders that music is a natural means for working with children, since most children respond readily to musical activities. Such gospel musicians as Philip Bliss. Ira Sankey, George Root, Charles Gabriel and Fanny Crosby began writing a great wealth of simple types of songs that children could enjoy. This desire to reach and teach children for Christ through appropriate songs was one of the important factors that led to the rise of the gospel song movement during the latter part of the nineteenth century. Philip P. Bliss was born in Clearfield County, Pennsylvania, on July 9, 1838. His youthful days were spent on a farm in a lumber camp. He described his childhood as one of abject poverty. He was known as a large, awkward, overgrown boy. In 1850 he accepted Christ as his Savior and shortly thereafter joined the Cherry Flats Baptist Church of Tioga County, Pennsylvania. Early in life Bliss showed unusual talent for music. After a brief period of training, he moved to Chicago, where he became involved with Dr. George Root, conducting musical institutes and conventions throughout the West for nearly ten years. In 1874 Bliss was approached and challenged by evangelists D. L. Moody and Major Daniel W. Whittle to enter full-time evangelistic work with them. From this time until his untimely death two years later, Bliss's personal singing and song leadership were always outstanding features of any service in which he was engaged. His early home-going occurred when the train on which he and his wife were traveling from Pennsylvania to Chicago during the Christmas season overturned and plunged into a ravine, sixty feet below, killing 100 passengers. 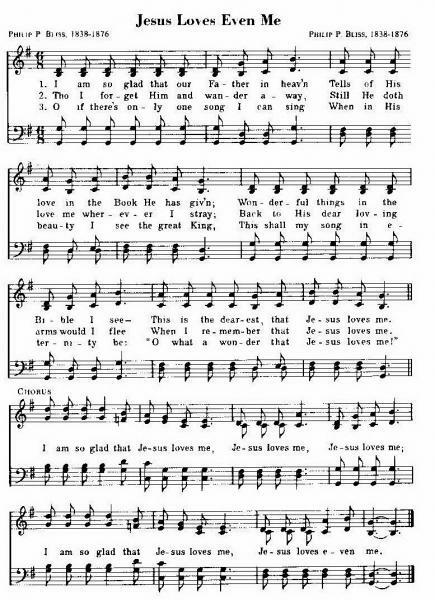 This hymn, "Jesus Loves Even Me," was written and composed by Bliss after attending a meeting where the hymn "O How I Love Jesus" was repeated frequently. The thought occurred to Bliss, "Have I not been singing enough about my poor love for Jesus and shall I not rather sing of His great love for me?" Under the impulse of this thought Philip Bliss composed this hymn, later to become one of the all-time favorite children's hymns. It became popular immediately in Great Britain as well as in this country. The hymn was first published in Bliss's The Charm for Sunday Schools, 1871. Other hymns by Philip P. Bliss include "Hold the Fort” (No. 30). "I Gave My Life for Thee" (No. 34), "It Is Well With My Soul" (No. 44), "My Redeemer" (No. 59). "Let the Lower Lights Be Burning" (101 More Hymn Stories. No. 55) and "Once for All" (ibid., No.72).